Preheat oven to 400º F. Rinse wings and drumettes and pat dry. Transfer to a large bowl and toss with vegetable oil and spice blend until well coated. Position wings on baking racks in a single layer ensuring that wings aren't touching. Bake, rotating pan half-way through until fully cooked, 45 to 50 minutes. Remove wings from oven and transfer to a large bowl. Whisk together hoisin and blackberry jam in a small sauce pot over medium-low heat until warm. 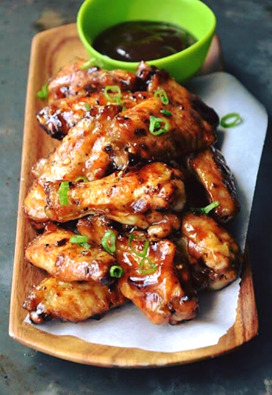 Drizzle wings with sauce, tossing until well coated. Serve immediately.